Finally, off on our much-delayed visit to Vienna and Prague! Passports and visas in place. Clothes packed and reservations made. Research completed. We're flying BA, which seems a comfortable way to go. We took advantage of Lorrie's "Park & Fly" service [ie we left our car at her house and she drove us to and from the airport], so arrival at TIA was uneventful. 5711 km is the noted distance we'll fly in the next 6 hours, 45 min. to Heathrow. We're taking off at about 6:35 pm and arriving there at 6:24 am. Then a few hours later, on to Vienna. Arrived London Heathrow quite pooped, having dozed a bit on the flight. Dinner was lamb, and I pouted so much they brought me beef from business class! We navigated from Terminal 4 to Terminal 1 with no problem, though there were line-ups for shuttle busses and security. It's easy to see why they allow lots of time between flights. We both slept most of the way to Vienna. On arrival we bought our 3-day Vienna Cards (WeinCarte), but still took a hotel shuttle to avoid navigation hassles. Pension Arian is very nice, up a lift that was built in the 19th century, I'm sure, from a narrow passage between old buildings. Lots of space, newly furnished, very comfortable. After sleeping for about 3 hours we set out on foot. The ring is several blocks from the hotel, so we walked there and along a few blocks through the Museum Quartier, near the Hofburg. 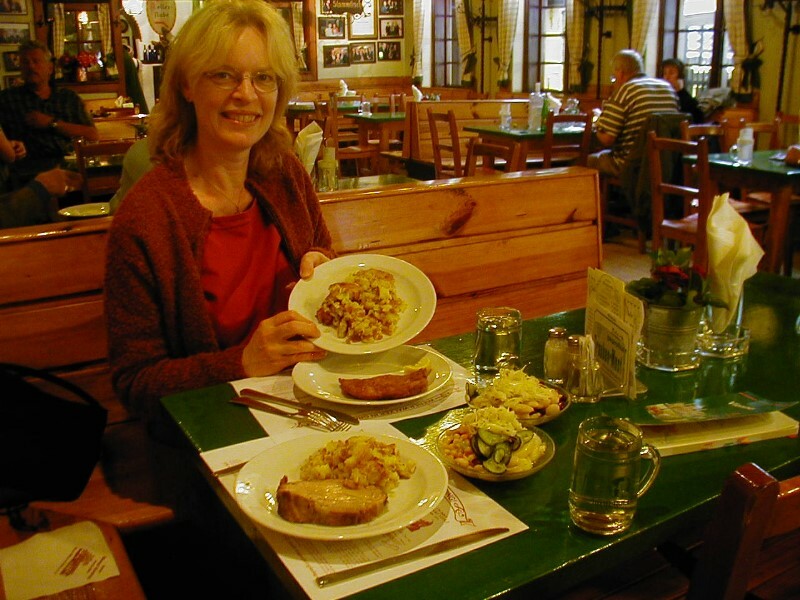 We wandered into a small restaurant and had a lovely meal -- weiner schnitzel, swein something with noodle/dumplings finishing with apfelstrudel. Wonderful. On the way back to the hotel we joined briefly into a celebration of the re-opening of part of the museum -- food, drink, singing. From there we hopped on a tram and went to Hofberg. 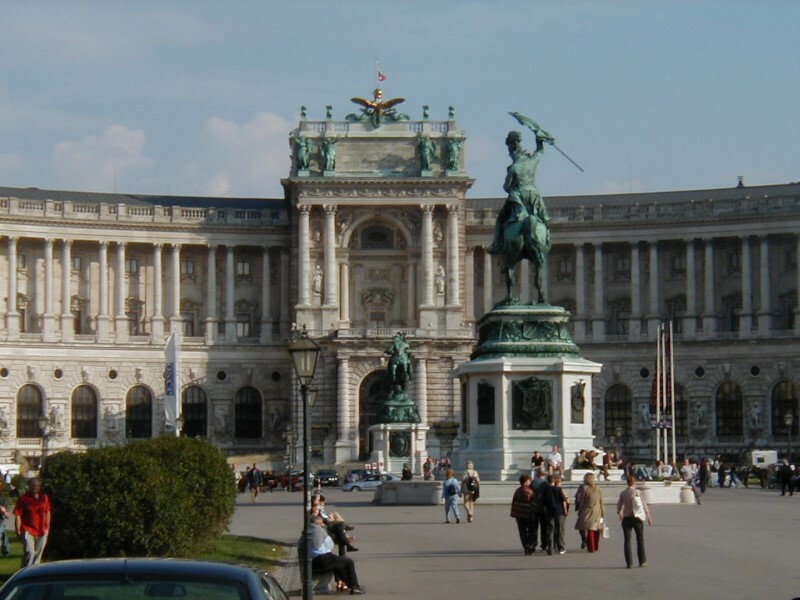 We toured the Schatzkammer, where the Imperial Treasury is -- or its remains. The highlight is the Imperial Crown, but it's an interesting collection overall. From there we went to the silver and porcelain display. Those Habsbergs really set a fancy table! Thousands of pieces are on display. From there we moved on to the Kaiserappartements, where we saw more of how they lived. 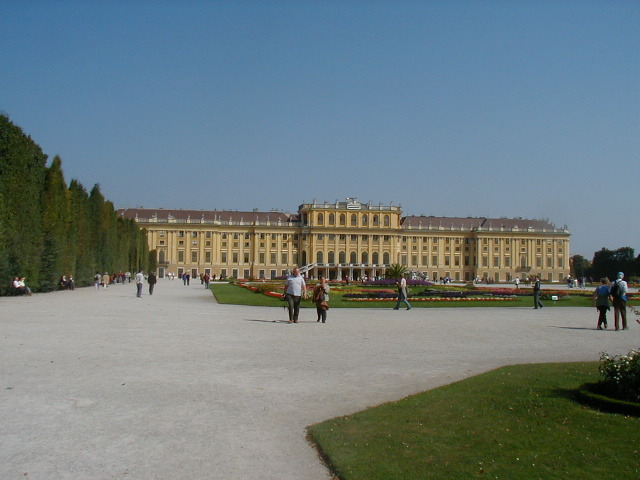 The Habsbergs inhabited both Hofberg and Schonbrunn for several centuries, 'til they went into exile in 1918. 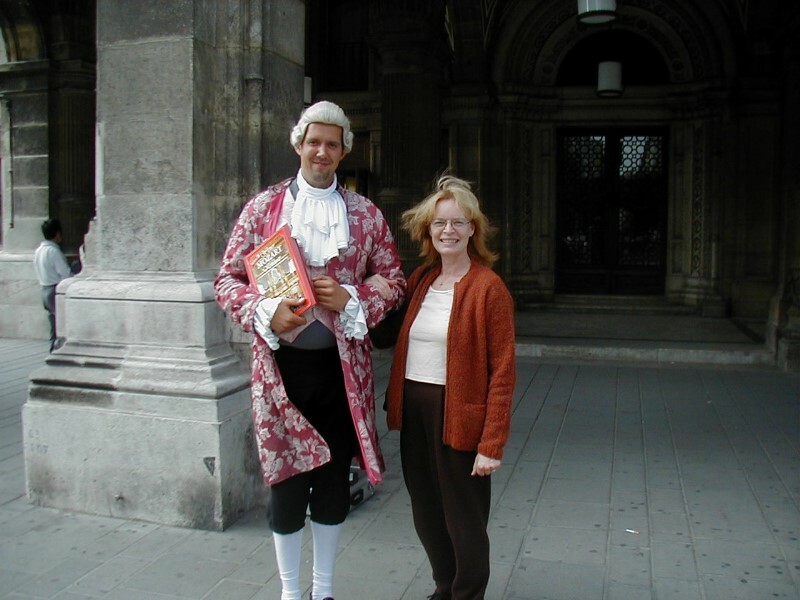 Just after lunch, we encountered costumed city employees selling concert tickets for tonight's performance of the Vienna Mozart orchestra. We bought balcony tickets. A chance to dress up and mingle! It was a very good concert, with a small orchestra, a pianist and 2 singers. At the end, the conductor even conducted the audience. We travelled to and fro by subway which Larry is becoming adept at navigating. The weather has been nice, bright and warm, but tomorrow promises to be cooler. After another nice breakfast at Pension Arian, we were picked up by the tour company and whisked off to the Wachau. 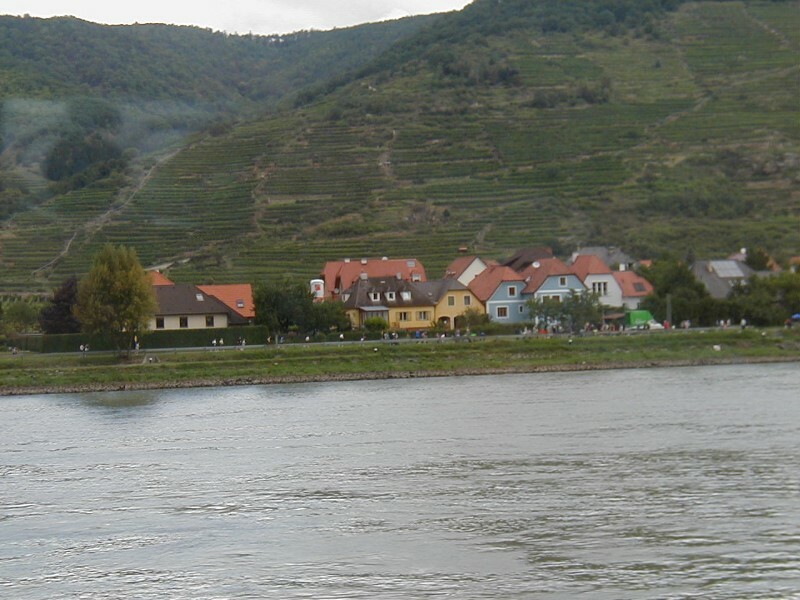 The bus took us through the countryside and several small towns to a vineyard, which we walked through, down to the edge of the Donau (Danube). 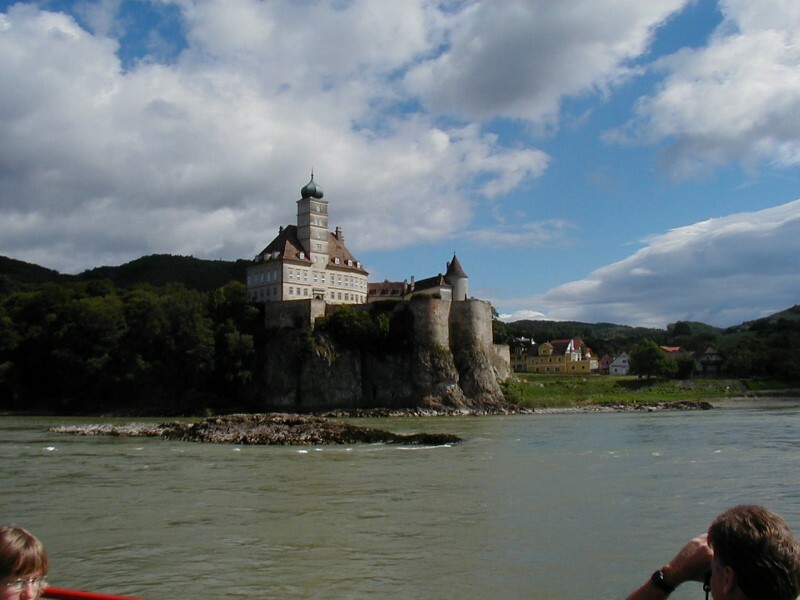 We took a ferry across the river to Spitz, where we boarded the Prinz Eugen for a 2 1/2 hour cruise upstream to Melk. 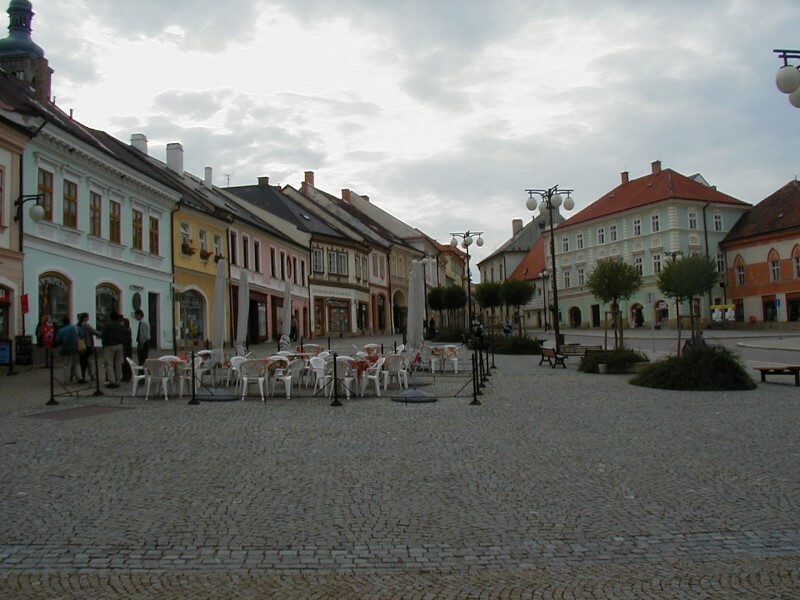 At Melk we climbed down to the village to wander for an hour or so. Beautiful little town. Then the trek back up the hill to the Abbey for a 45-minute tour. It has a gorgeous library and really beautiful church. It has been occupied by monks for about 1000 years. Onboard the boat we had beer, sausages and a roll on the sundeck -- though it was raining off and on. There were many castles and other ruins along the shore. Most disturbing were the evidences of the record-breaking flooding about a month ago. The trees had high-water marks about 20' above the water level and there was a lot of mud on the banks. In many places trees had been toppled. We noticed at Melk that other historical sites that "restoration" has been more like "renovation", with the result that nothing feels very old. Nearly every place reports WWII bomb damage. We're getting very adept at navigating by subway. Today we went first to St. Stephen's and the area around it. These very old churches are marvels of construction engineering and artistry. The streets are very narrow and twisty -- and cobbled, with many interesting buildings and fountains in many parks and squares. 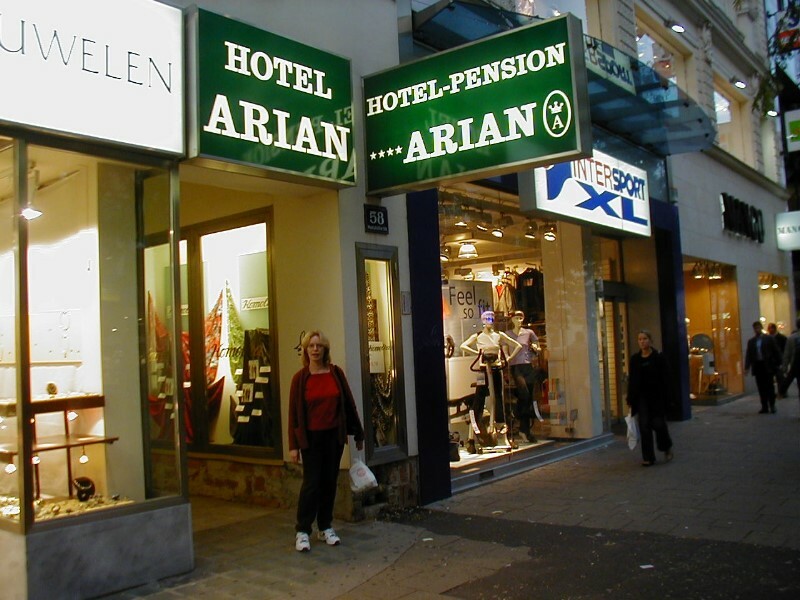 We walked to St. Peter's by way of the high-end shopping area of Kartnerstrasse and Grabon, stopping at Movenpik for cappuccinos -- with sugar in cute little tubes of many colours. The walk of fame here includes names such as Mozart. For a break from churches and other serious sites, we headed to the Prater and a ride on the Riesenrad -- a huge ferris wheel with enclosed cars. Great views over the city! We lunched in the Casino and Larry lost .50 euros in a slot machine. We then did a recce of our route to Prague. Took the suburban train to Sudbahnhof and bought reservations and tickets for the train, and figured out where we catch the train. Later on we also tracked down a bus that leaves from near our hotel and goes directly to the station. After that excursion we dashed to the Opera House in time for the last tour of the day. WOW! The parts that were undamaged in WWII are gorgeous, baroque style. The restored sections are modern and very plain. They still have standing room, with good view, but only we think for the young and healthy! From the Opera we walked to Karlskirche. It too is beautiful! However it is largely covered inside with scaffolding. The parks around it are very lovely and peaceful. After this busy day, back to the hotel and feet up! The plan for the evening is take-out food and relaxation. So much for good intentions -- we walked out looking for take-out and instead found a restaurant nearby called Hoofbrau -- where we had roast pork with kraut and dumplings and beer. Once more a delicious meal. Our last day in Vienna and a full one. We slept late, but still arrived at the Fine Arts museum before the doors opened. Once inside we wandered through the Egypt section which is very impressive, particularly wall paintings from a church in Faros that was inundated when the Aswan Dam was constructed. 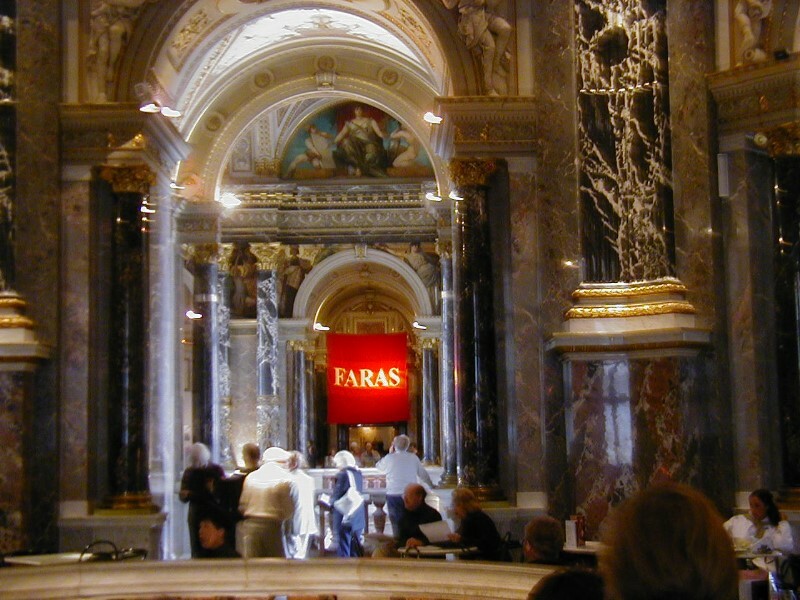 After wandering through the coin collection, which features the Schilling-Euro transitions we had lunch at the museum. We then finished off with the paining gallery, where we saw all the great names. From there we headed to the UN complex, which we admired from the outside only. We then headed for the suburbs, Grinzing, to be exact. First we went well beyond that town to a couple of smaller places where there are fabulous views back towards Vienna from up in the hills, overlooking vineyards. Back in Grinzing we wandered for a bit, but soon our very sore feet demanded that we find a table and refreshment. At a local heuringer, we had their own wine and a real feast from the hot and cold buffet. We watched with interest as they set up tables for about 50 people, with food laid out -- a busload we supposed. Then about 45 minutes later they gathered it all up again. Meanwhile, we visited the WC before leaving, and found musicians practicing in the hallway. They set up and began playing just as we left. Back at the hotel we began gathering ourselves together to leave for Prague tomorrow. And ate roasted chestnuts we'd bought from a street vendor -- as if we needed them! What a weird day this has been! We left Vienna with no problem and arrived that the Sudbahnhof in plenty of time. Today at breakfast was the first time the breakfast room was full and it was somewhat chaotic! At the station I decided to pick up some food and drinks for the trip. Good thing, too -- just as we were about to leave the station, there was an announcement that there would be no food available on the train. We relaxed in separate window seats and enjoyed rolling through the Austrian and Czech countryside. Some lovely views but some very unsightly, apparently-abandoned factories and so on too. 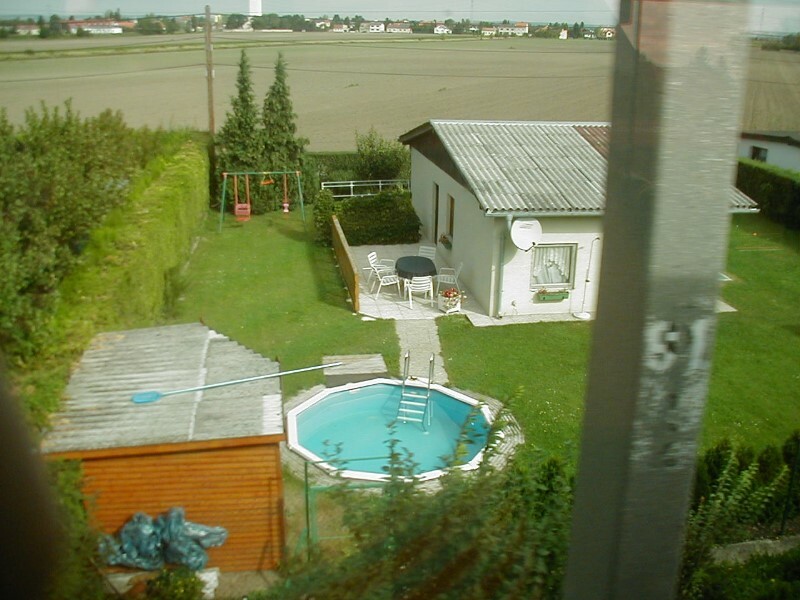 Houses are tiny -- people live in what look like garden sheds sometimes, but have small above-ground pools in their yards. 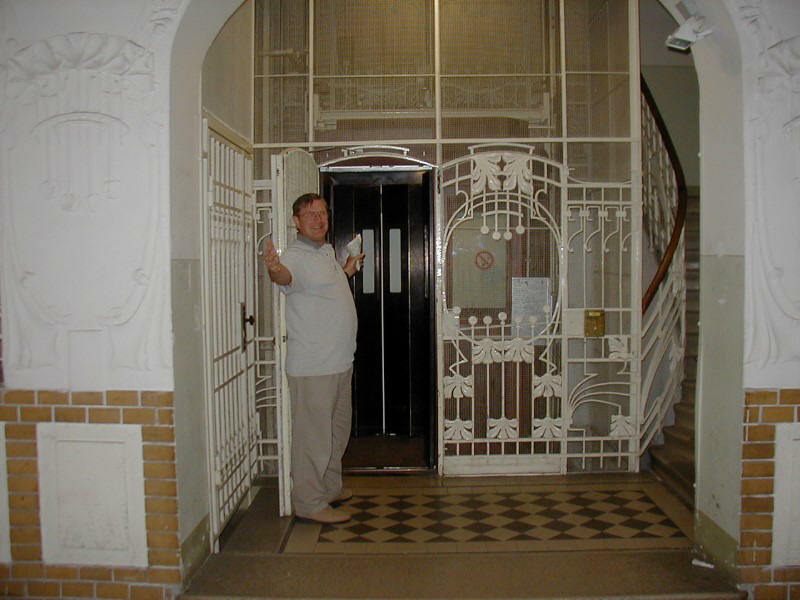 When we arrived in Prague, we were not at the station from which Larry had planned our route to the hotel. After about 15 minutes of disarray, we realized we could walk to the hotel in a very few minutes. We went straight to Wenceslas Square but the street names and numbers are hard to follow and it took some time to find the entrance to the court-yard of the hotel. 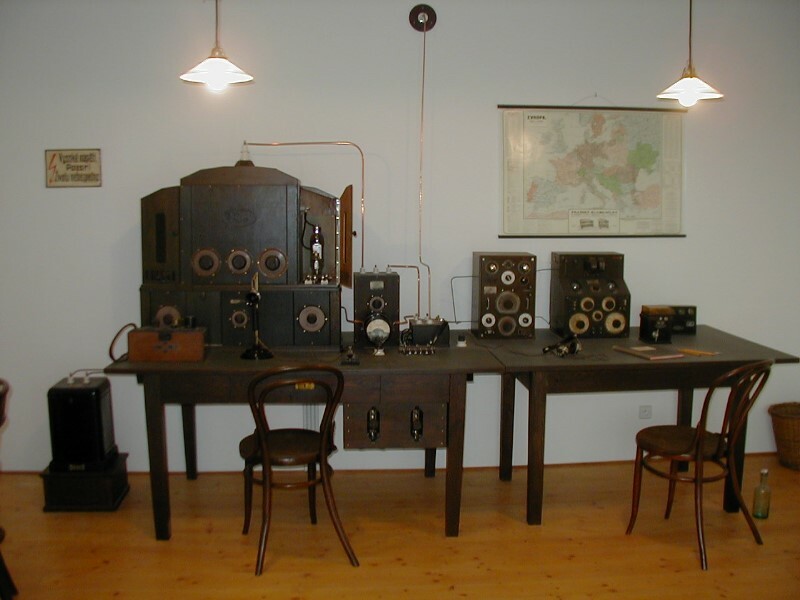 It's a strange set-up with reception in an internet service office. However, the young woman who seems to manage it met us there and showed us to our temporary room. After one night we must move. Something about repairs to water damage. We gratefully dropped our bags and headed for the beds to recover from the trip. Mine immediately collapsed! We fixed it, but it broke again, so my mattress is on the floor. After a rest we headed out to see the town and have dinner. We wandered the length of the square and through some side streets. We found a restaurant with sidewalk tables where we had a Czech meal (according to the menu) and pilsner. We also picked up Prague Cards (3 days of public transit and free entrance to all museums, the castle, etc.). We wandered across Charles Bridge after picking our way through some of the devastation from the flood. Then we decided to hop a tram back to Wenceslas square. Easier said than done! We realized it was the wrong one, hopped off and then got on the right one, but going the wrong way. We figured we could do the turn at the end of the line and come back, but it went into the barn. That meant walking several blocks in search of a stop that would actually get us onto a tram going the right way. Eventually we found one, waited about 15 minutes and rode back to our destination. Looking at the city map and the public transit map I still have no idea how to navigate but Larry claims he does. That wasn't the end though. When we got to our room, the key wouldn't open the door. When we went to get help from the internet people, the elevator quit, so we had to walk back up to the 4th or 5th floor. They guy had no trouble and afterward we could work it too. Go figure! I think that Prague would be confusing at the best of times. There's English here, but much less than in Vienna and the Czech language is less comprehensible to us than German is. The city is not anything like a grid, with narrow winding streets in every direction. The street names aren't well-marked, and the maps are hard to read. Prices are hard to translate -- 20K to $1 CDN. I keep gasping at the big numbers. Like 690 K for the Prague card. Forking over 1380 at one go for something like that was starling to say the least, but since that only about $69 it's not so bad. The room we have tonight is nice, with hardwood and ceramics, an efficient little kitchen and 2 rooms plus the entry and bathroom. There are 2 other beds in the other room, so if I wanted I could sleep there. No phone, but apparently many phones are still out anyway after the flood. TV, couch and 2 comfy chairs. We'll have to go out for breakfast, since it's not included and we don't have food. We'll shop for breakfast things for the rest of the time, tomorrow. Hoping Mom's feeling better. She sounded fine last night, but can't be perfect or she wouldn't be in hospital. We did better at navigating Prague today. Or I should say Larry did. It’s still all a mystery to me! We took a few trams to get to the castle, which is very interesting. The cathedral is gorgeous with a lot of modern stained glass and some older too. We visited the crypt, which was not nearly as spooky as the one in Vienna. I didn’t even write it up, but it haunts both of us. 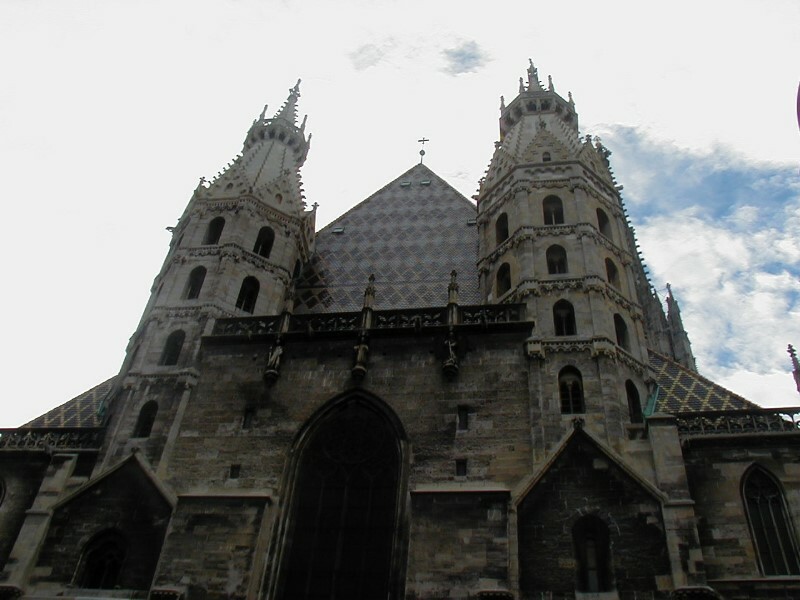 It has several places where you can actually see heaped-up bones, mostly from plague victims. The one here is quite sanitized with only one buried vault which holds a neat array of important coffins. The old Royal Palace is largely empty, but the Vladislav Hall and the chapel are very impressive. We took another tram to the area of Loreta, but it wasn’t immediately evident where it was – a common problem here, where directions are vague and names undecipherable. Maps likewise. We gave up and decided to just wander a bit. Of course, we immediately stumbled on Loreta, which proved to be a high point of the day. Lovely and tranquil with a most interesting treasury of valuable and beautiful things, including the “Prague Sun” which has 6500 diamonds from the wedding dress of some countess. Some of them are real doorknobs! The church and shrine to Mary are also most impressive. From there we wandered downhill, stopping to rest in a lovely park, and strolling through tiny, cobbled, twisting streets on the way. Oddly and without explanation we found ourselves back at the palace. Recognizing it after only a few minutes, we continued down to the Charles Bridge. That surrounding area was badly damaged by the flood with the result that many streets are torn up and buildings are closed. The bridge, though, is fine. It’s full of vendors and entertainers. We picked up a framed print. Earlier in our wanderings we spotted some unusual wine glasses and bought a couple. By the time we were out of the immediate area of the bridge, it was necessary to stop for beer (Larry) and dessert (Jan). Reinforced, we went in search of Friday-night opera tickets. Box seats, no less, for Aida! Finally, we arrived back at our hotel, to discover that while our bags had been removed from the temporary room, they hadn’t been delivered to the new, “real” room. So we schlepped them – and of course, the elevator wasn’t working. We decided to call in the owner’s rep and pay our entire bill, since we wanted to be rid of the cash and not have to worry. The new room is very, very nice. 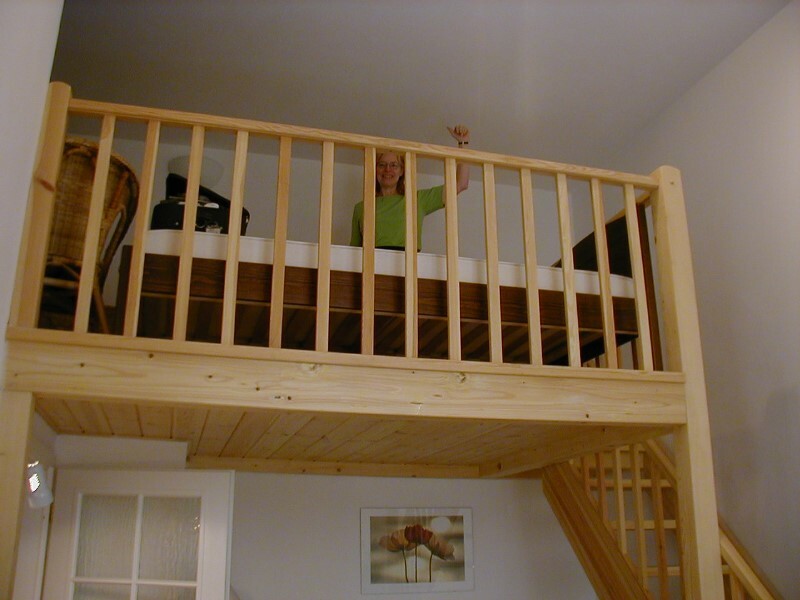 A loft bedroom over a main floor living room, kitchen, entry and bathroom. We’ll check the bed for solidness before we get into it! Oh yes – before coming to the hotel we did some grocery shopping, since we have a kitchen. So we schlepped that, too. The grocery store was in one of the subway access areas, at a place where there is still a lot of water in the subway. Doesn’t smell great down there! After a rest we strolled out for dinner at the hotel across the street, then to the Internet service in our hotel to send off a message to the family. Now it’s relaxation time. Phew! A lasier day, with all three meals in our “room” – since it has a kitchen and we’ve found a grocery store (Billa) what could be better? We walked around Old Town Square again, watching the clock strike 4pm and all the little animated figures doing their various “things”. We shopped at the street vendors there and on Charles Bridge, getting a few small gifts and some trinkets for ourselves. In the morning we had wandered through an anthropological exhibit at the Museum, and looked more closely at Wenceslaus Square. That, of course, was followed by another wild goose chase on public transit. We haven’t mastered that aspect of Prague yet! 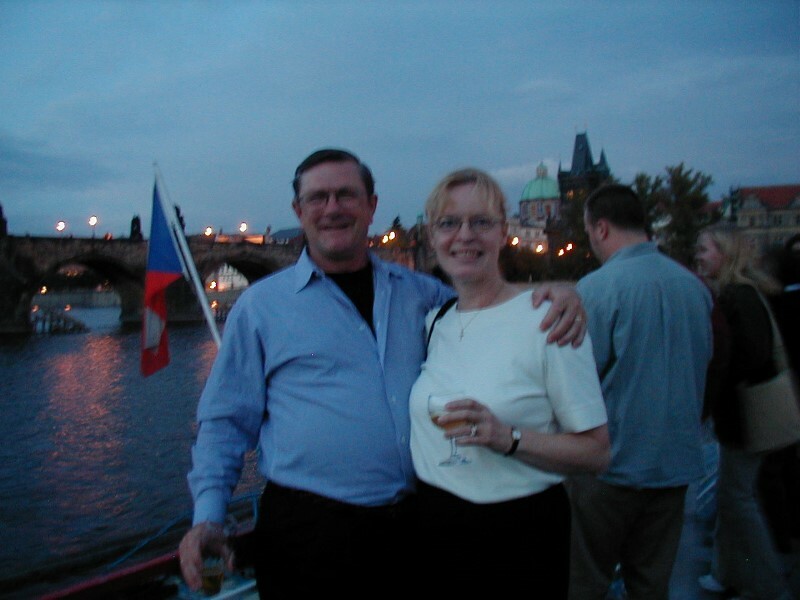 In the evening we dressed in our best and went off to the Prague National Opera, to see Aida. We had seats in a very good box, and one other guy was in the same one, with 3 empty seats. He clearly knew more about opera than we did, though we do both know the Triumphal March well enough to hum it recognisably. Three people are very crowded in the front of a box, and it’s a three-hour performance. But really, really impressive and beautiful. 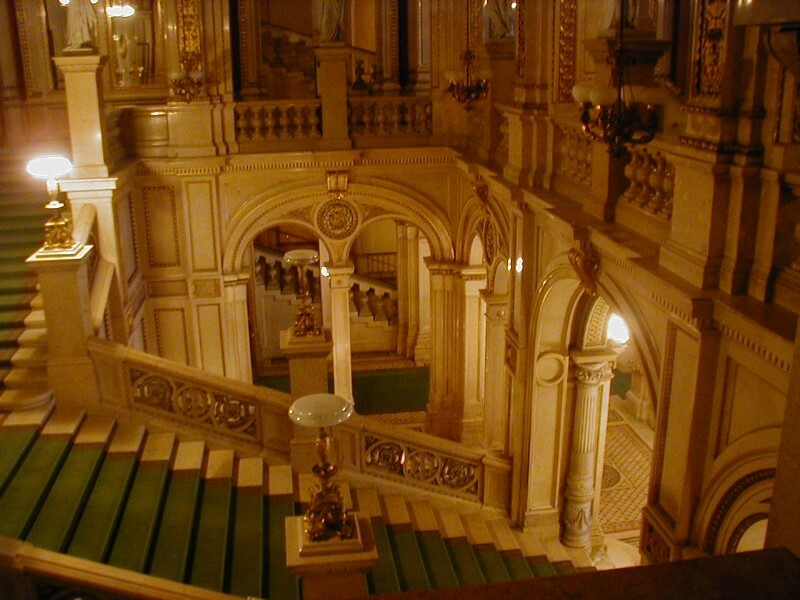 The libretto was on a screen above the stage – in Czech only, of course. Didn’t help us much, but we read the story in the program ahead of time. Quite thrilling, and the theatre is beautiful. Dessert afterward in a cellar restaurant. They do wonderful things with pancakes. The area around the Opera is all cordoned off and guarded by police and military carrying impressive weapons. What’s this about? We’ve noticed barricades at different places around the city and lots of police and military. No explanation that we know of. Some of it may have to do with the flood damage. There’s so much repair work and construction going one, and buildings boarded up. Pumps and driers running ‘round the clock. Another lovely fall day. The leaves here are turning brown and yellow, and many have fallen. I’ve been wearing a sweater, but often have tied around my waist. Larry’s usually in short sleeves. Today we decided that we had to explore our route to the airport for Monday. There is an airport shuttle from Namesti Republiky, which is easily reached by tram from very near where we’re staying. We tried it all out, checked the schedules and are confident we can do it, as long as we can wake up by 5 am! Satisfied with that, we visited the tour vendors and arranged for tours for today and tomorrow. Then we strolled through the Josephov area. That’s the Jewish area, with many synagogues and the Old Jewish Cemetery. The cemetery is closed because of flood damage, and it’s Saturday so the synagogues were not open to the public either. We may have time to go back Sunday. We tried to climb the powder tower, but I couldn’t do it – too claustrophobic. So instead we sat in front of the building and surveyed the activity on the square while we ate a leisurely lunch. Afterward, we boarded a tour bus for Kutna Hora where we spent the afternoon. It’s a quiet little city an hour or so away. It was a silver-mining centre and the country’s official mint. It fell on hard times when the silver dwindled, so is largely untouched. 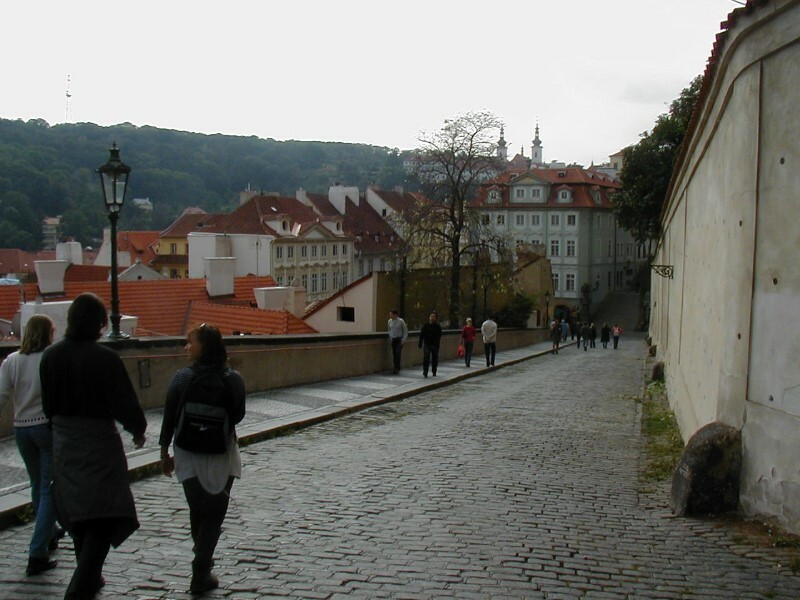 Steeply winding cobbled, narrow streets. A wonderful church with a fantastic roof. Many sculptures, and the old mint. On the way back we stopped at an ossuary. How weird! Human bones in great pyramids, and turned into chandeliers and wall decorations! We went inside in spite of our “willies” over the crypt in Vienna. Back to our room for a quiet, late dinner and restful evening. Tomorrow is our last day. We are starting to look forward to home. 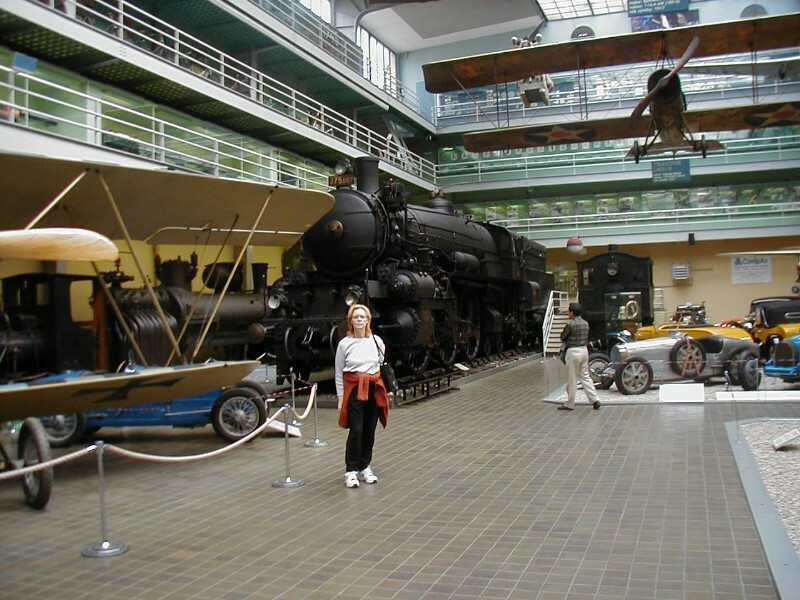 Having missed the Technology Museum earlier, we went there late this morning – we had a slow start. It was interesting, but only for an hour or so. We then found our favourite lunch spot on the terrace in front of the Municipal Hall and enjoyed the passing scene for a while, before wandering back to the Josephof area in hope of seeing some of the synagogues. However, it appears that all are closed, since the crowds all seemed to be on the sidewalk and no ticket office could be found. It was time to get a last couple of souvenirs and pack for home. After that and a brief rest, we headed out in the rain to find our evening tour: Prague by Night. 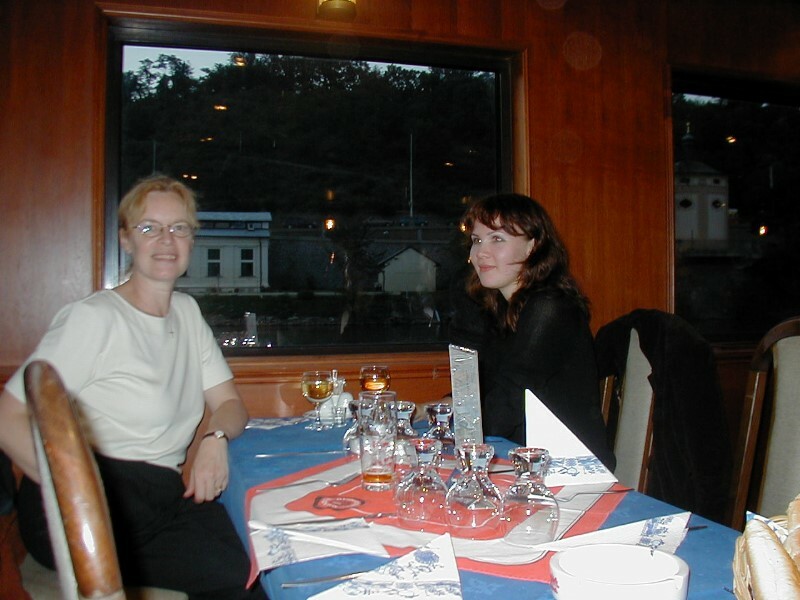 This consisted of a short narrated bus ride around the chief attractions followed by a dinner cruise, with a jazz band. If we could have been out on deck it would have been more interesting. However, we sat alone at a table with Julia (Yulya) from Moscow. Her English (self-taught!) was very basic, but we had a good conversation nonetheless. 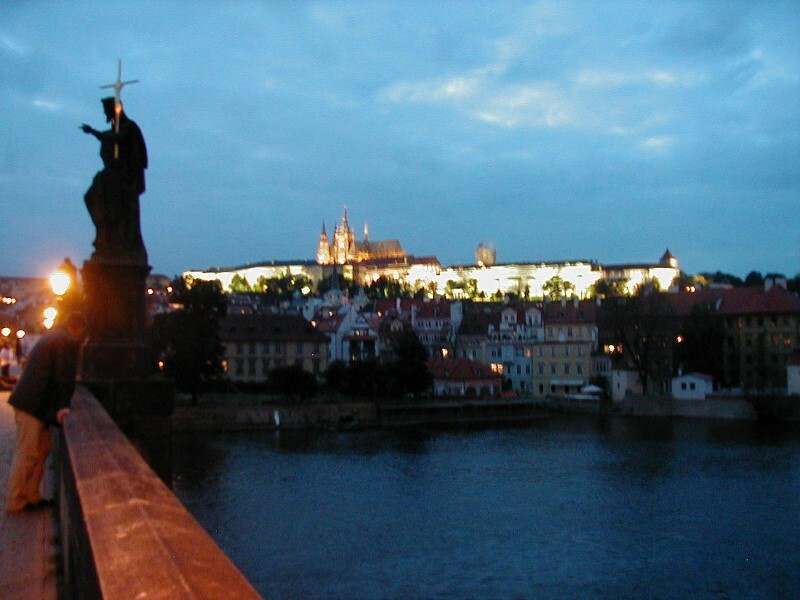 She was in Prague alone, having left parents, sister, husband and daughter behind. It must be lonely to travel like that. The food was OK, music very good, and when we braved the rain, the view from the upper deck was also terrific. 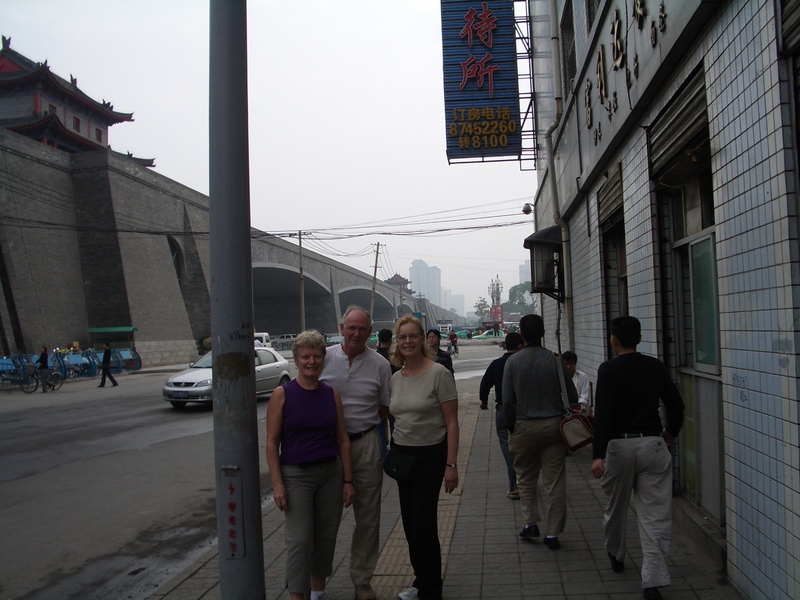 Then the walk back through rain-washed streets from the river to our hotel. As usual, the carousers of our building awakened us with door-buzzing and talking and laughter around 4:15 or 4:30. Good timing, since we had to be up and on our way. We left around 5:15, caught the 5:30 #14 tram to Republic Square, then the airport shuttle at 6:00. We had to line up 4 separate times: British Consular Services, BA counter, Czech exit and security. That took a while, but we still had about 30 minutes in the boarding lounge. On the shuttle we chatted with an Australian woman who was visiting her daughter. The daughter has been at school in Europe for a year and is soon leaving for a 4-month stay in Vancouver. They have both obviously travelled a lot, as Australians seem to. The flight to London was uneventful. Now we’re sitting at Heathrow waiting for our gate to be announced. It’s nice to (more or less) understand the PA announcements. It’s been a terrific holiday, and fuelled my desire to see more places. The best part, always, is walking the streets, sitting in the parks and cafés and seeing life go on in a strange place. Grocery shopping. This morning, the 5:30 traffic around Prague was very interesting. Many of the trams were full and there were quite a few trucks (garbage, delivery) and pedestrians, but very few cars. Walking near the river, we saw some buildings with all the stucco off the bottom several feet. We were told that some parts of the subway will re-open by November, but others not until January. Some lines are running, but none near the river. Passing anywhere near the entrances to metro stations, the smell of flood is very strong. Since most of the stations have shops, etc., there’s still traffic through them, but much less than usual. Tram lines are running between metro stations, as well as extra busses. Since the city has such a non-grid layout – really spokes out from randomly-distributed squares, navigation is tough. We were lost more than once. Larry says “not lost” just in the wrong place. However, after a few days even I got to know our main routes. I think I could master the system in a couple of weeks.